So it may be the south of France but it’s not hot and the bathing belles on the beach all have wet suits on. 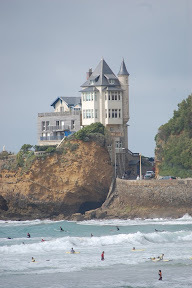 We are now in Biarritz and spent a day wandering the quiet (Easter Monday) streets, enjoying stumbling across little discoveries of shops, alleys, beaches and views. It’s a great town with a lot too it and a lot nearby. The beach front is absorbing with the mix of old and new buildings, the great sandy beaches and the way the sea rolls in and bounces off the rocks. 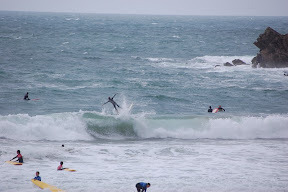 It’s not been stormy but there is plenty of wave action for the surfers who range across all ages and skills. 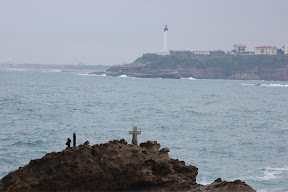 There is plenty of evidence of sea misadventures too though it’s not yet been clear enough for us to climb the lighthouse. Something for the weekend sir! That was a great photo I got of you just falling off your board! Wipe out! Good surfing honey!